This hair removal kit is perfect for removing hair on legs, back, arms, chest and stomach. You can save $18.35 by purchasing these two products together. The Emjoi Emagine Epilator has 72 tweezers, the most on the market, is perfect for removing hair efficiently, removes the majority of hair the first time, saving time and eliminating potential skin irritation by reducing the number of passes required to achieve smooth skin. Use Kalo Spray directly after removing body hair with the Emjoi Emagine, weaken hair and prevent about 10% of the hair from growing back after each hair removal session with Kalo. Kalo should be applied 3 times the day of epilating and 3 times the next day. You should notice results after about 2-3 hair removal sessions. Most people will require about 10-15 sessions to completely rid the hair. I had an epilator by the same manufacturer for a couple years that burned out on me. i decided to purchase this one as a replacement. Id have to say this one is much better than the last. It has more tweezers so it pulls out the hair faster with less pain. i only had to go over the area a couple times, and when I use it with Kalo less hair grows back. I absolutely recommend! I tried my mom's Emjoi Epilator and Kalo spray and I was so surprised. I thought the spray would burn like nair does but it was painless. Also I didn't smell harsh chemicals either. The Epilator was also painless. I am not fond of paid like waxing and such but when I used this product it was awesome. The Epilator is a little loud and I wish it had a pouch or a stand to put in the shower. But overall it works great. I don't need to shave much at all because the hairs are so fine that you can't even see. I will get my own soon and continue using the product. hair growth is not as thick and hopefully by the next 2 treatments, I may not have to shave those areas again!! With my return of severe Psoriasis and with my very hairy body, I had to cut short or remove hair on my body so I could properly treat the infected areas. 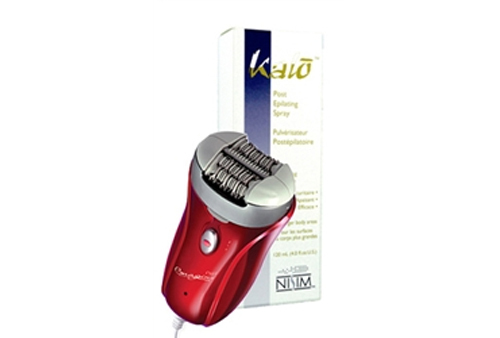 Emjoi Emagine I use in some areas to help remove the unwanted hair. Use as directed, I find it has been effective with minimum dis-comfort. Kalo Products to have worked the best for me to lessen and stop regrown of the hair.